Chicken is one of my favourite things to cook on a barbecue thanks to the fact you can pretty much do anything with it. It goes well with a variety of marinades and tends to be a winner with all of my summer party guests. I must admit, I sometimes forget this fact myself, and often stick to the tried and tested recipes - mainly grilling plain chicken on my Weber charcoal. While I think the smokey taste of the coals is sometimes all you need, below are five of my top recipes that I love to whip out to especially impress my guests. Firstly, when I'm looking to provide the wow factor for my barbecue, I like to coat chicken breasts and thighs in a Tandoori marinade. Indian cuisine is hugely popular among my family and friends, and this always goes down a treat. Simply stick ginger, paprika, garam masala, cardamom seeds and garlic into a blender and marinade the meat for a good few hours ahead of your guests turning up. I always make sure I prick the skin with a fork to really allow the sauce to sink in, while I lift the skin up and push some sauce under there too. Tandoori chicken tastes fantastic in pitta bread with salad and plain yoghurt, and you might like to do some kebabs for little ones too, but with unflavoured chicken. These are easy to eat and a lot less messy than kids eating drumsticks with their hands, while they probably won't even noticed you've sneaked some lettuce, cucumber and tomatoes in there! 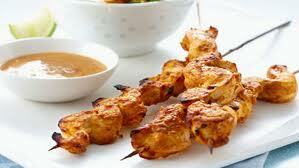 Another Asian-inspired recipe I like to use every now and again when bringing out my Weber Compact is chicken satay. Just a quick word of warning before you embark on this, though; check if any guests have nut allergies, as you'll need to clean the grill and utensils after making this so they don't contaminate other food. You might decide to do this dish last, as that way you can be doubly sure. Coat your chicken in a peanut cooking sauce, and while that's barbecuing, get a friend or family member to heat up the remainder of the peanut sauce with some lime and coconut milk for around five minutes in a pan. Once heated, this can be poured into small bowls so your guests can dip their chicken skewers into them. Having a platter of chicken satay skewers looks impressive with the bowls of dip, and will definitely go down well with your guests. For a dish that isn’t quite as full on with flavours, I like to very slowly grill chicken with sweet onions and peppers. You do have to be patient for this one, as burnt bits will ruin the subtle flavours of this combination. In fact, I'd recommend making sure your barbecue isn't too hot for this recipe and cooking the meat and vegetables for around an hour. Perhaps serve this dish first, and start the cooking process a bit before your guests are due to arrive so they aren't waiting around too long for their food. Of course, whichever dish you choose, make sure chicken is cooked all of the way through with no red bits. 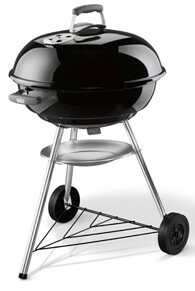 Having a BBQ with a lid-mounted thermometer can help provide peace of mind that poultry is safe to serve.